This 4-day ski course in Auli allows you to spend time on the famed slopes, learning how to use your ski equipment and enjoying the gorgeous views. You'll be taught by experienced skiing instructors, and will soon master the basic skills and techniques required to glide down the snow-covered slopes of Auli. Over 2 days, you'll spend 10-12 hours learning to ski. This is a beginner's course, so you are not expected to know anything about skiing. No prior experience is necessary. NOTE: A minimum of 2 persons is required to make/confirm this booking. Located in the midst of Uttarakhand's Garhwal Himalayas, Auli is popular winter destination attracting travellers from all around the world. Here, the winter season brings with it adequate snowfall, blanketing every meadow and mountain in sight with a thick layer of snow. The vast snow-clad slopes and pine forests make Auli one of the most popular ski destinations in India. The slopes are perfect for beginners who are learning skiing and will need increasing levels of difficulty. • Learn the basic skills of skiing over a short itinerary. • Stay at a charming ski lodge with wooden flooring and spectacular mountain views. • Catch astounding views of the snowy mountain peaks. • Glide down the mountain slopes of Auli. • Explore this picturesque and charming little winter town. 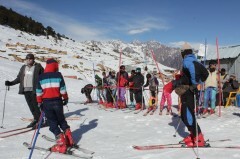 Travellers are required to follow instructions of the skiing instructor during this short skiing course in Auli. For cancellations made more than 15 days before start date of the Auli skiing course: 85% refund. For cancellations made 11-15 days before start date of the Auli skiing course: 50% refund. 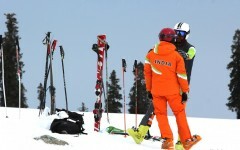 For cancellations made less than 11 days before start date of the Auli skiing course: no refund. At an additional charge, travellers can also avail a pick-up and drop-off service from Haridwar to Auli on the first and last day of the trek. These additional charges are: INR 12,000 per vehicle for Tata Indigo and INR 20,000 per vehicle for an Innova or Tempo Traveller. In this case, travellers will be picked-up from the Haridwar railway station by 06:30 hrs on day 1 and dropped-off at the Haridwar railway station by 20:00 hrs on day 5. A minimum of 4 travellers are required to book this service. 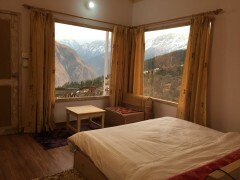 During the Auli skiing course, travellers will be accommodated in the Mountain Rover hotel in Auli. In case of any alternate arrangements, travellers will be informed before arrival in Auli. The tour operator takes utmost care to ensure safety of the travellers and shall not be held responsible for any mishap, accident or loss of life while skiing in Auli. 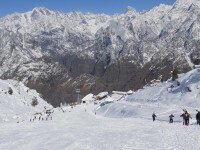 The tour operator reserves the right to cancel or alter the itinerary of this skiing course in Auli depending upon weather conditions and other factors. If extra costs are incurred due to changes in the itinerary, they will be borne by the traveller. There is no pick-up for this Auli skiing course. There is no drop-off for this Auli skiing course. 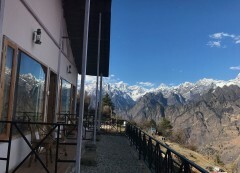 Arrive in Auli and check into your lodge. You can spend the rest of the day at leisure. Relax in your lodge rooms or venture out to stroll the streets or visit the local marketplace. Overnight in the ski lodge. Basic skiing equipment laid out to astounding views of the terrain. Begin your training by meeting the skiing instructors. Today's lessons will include an equipment orientation and introduction to skiing. You'll learn how to handle the various parts of the skiing gear. You'll also learn the various techniques and methods required for basic skiing. Practicing these skills on the snow will help cement them by developing muscle memory. Return back to the lodge by mid afternoon and spend the rest of the day at leisure. Overnight in the ski lodge. Learn the basic skills and techniques for skiing. Continue your training with the Auli skiing course. 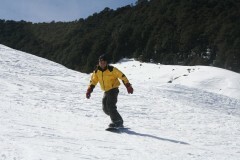 Today, you'll head for higher slopes by taking the Auli Ski lift and learning to dash over the snow slopes with grace. Return back to the lodge by mid afternoon and spend the rest of the day at leisure. Overnight in the ski lodge. Wake up to enjoy the views and have a relaxed early breakfast. After that, it's time to check-out of the lodge. Your trip ends here. Overnight in a ski lodge in Auli. Arrive in Auli and spend the day at leisure. You'll be staying in a ski lodge, in a cosy room with wooden flooring and large windows. Your room has a king-size bed, attached washroom with geyser, and a private sit-out. In the room, you'll have a room heater, free Wi-Fi, a tea-coffee maker, and all the bedding you need. Today's package includes dinner only. Begin your second day of training for the skiing course in Auli. While basic skiing equipment such as the ski, ski poles and snow boots are provided, you may want to bring additional gear such as snow goggles and ski suit. You'll be accommodated in the same hotel as yesterday. Today's meal package includes breakfast, lunch and dinner.